Our mini-van arrived to collect us at 6.30am and this time it was pimped – tinted windows, chrome alloy wheels and bull bars. Sweet ride we thought, scurrying to get our seats. Approaching the vehicle there looked to be no one on board, but when we flung back the sliding door we were met with a chorus of “Good mornings” from smiling, happy tourists. Our faces dropped. We were the last to be collected and the only remaining seats were the ones at the back. I wouldn't have thought it was necessary to SAY it?! 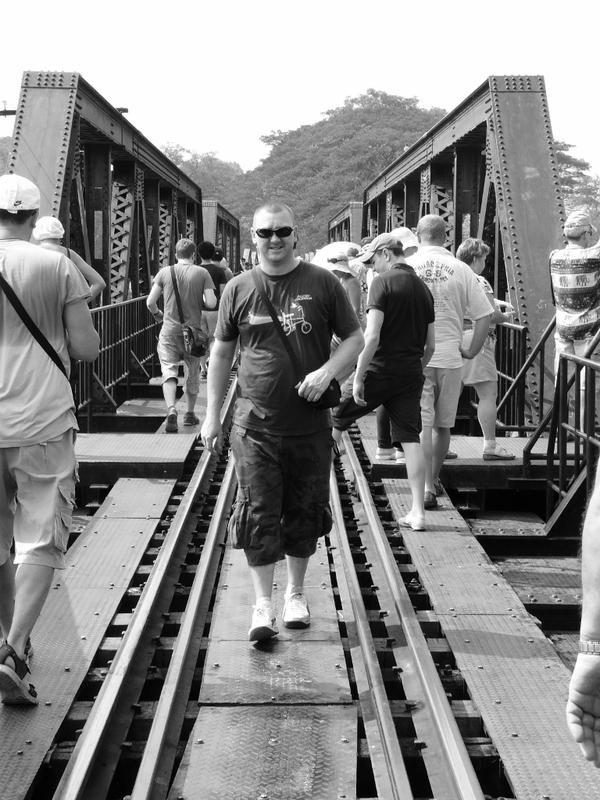 Having squished our way into the back seats we sat grim-faced as we bounced haphazardly out of Bangkok to Kanchanaburi. 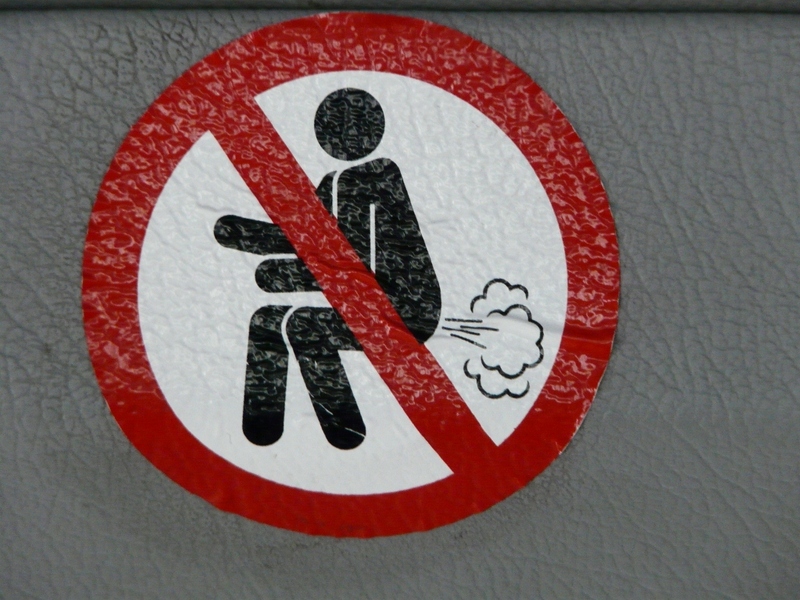 The only two things that made us smile in the next three hours was the thought we had sensibly eaten our breakfast while we waited outside the hostel this time, and this sign at the front of the mini-van. 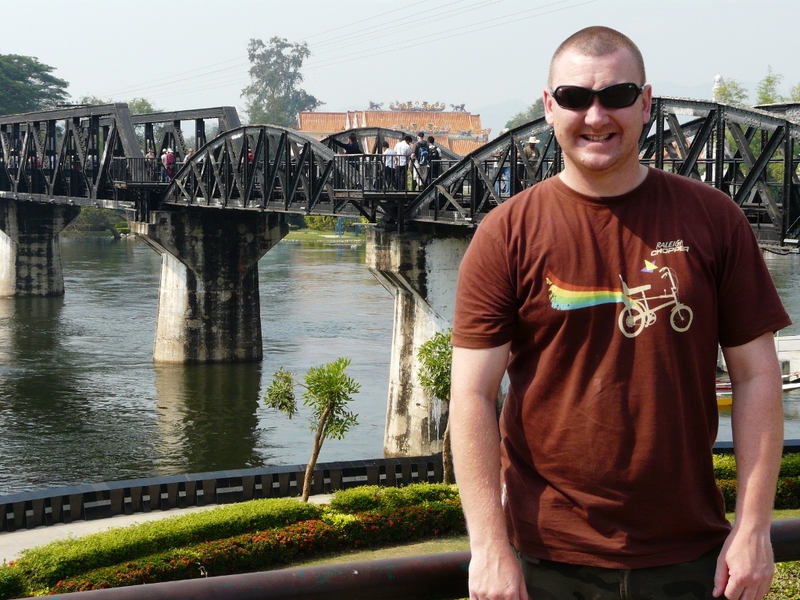 After a merciless drive, and with me dangerously close to vomiting all over the Canadians sitting in front of me, we arrived at the bridge over the River Kwai, made famous by Alec Guinness in the movie of the same name – and of course the Allied prisoners of World War Two. We battled our way through the hordes of tourists towards the bridge and after a quick stroll to the other side and back, we were back on the bus (groan) for another fifty minutes to reach the start of our rafting expedition. 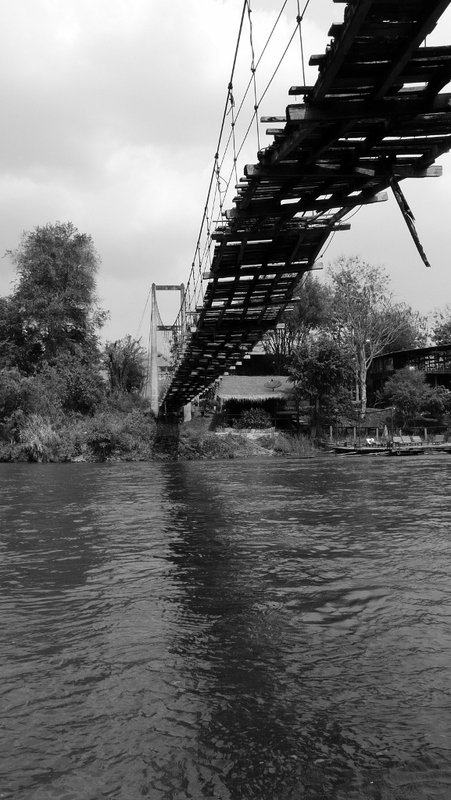 We both donned oversized, brown camouflage life jackets – God knows how they were going to find us in the brown debris filled river if we inadvertently fell overboard – and clambered carefully onto a traditional bamboo raft which was towed about one kilometre up river, before being released to drift peacefully downstream. 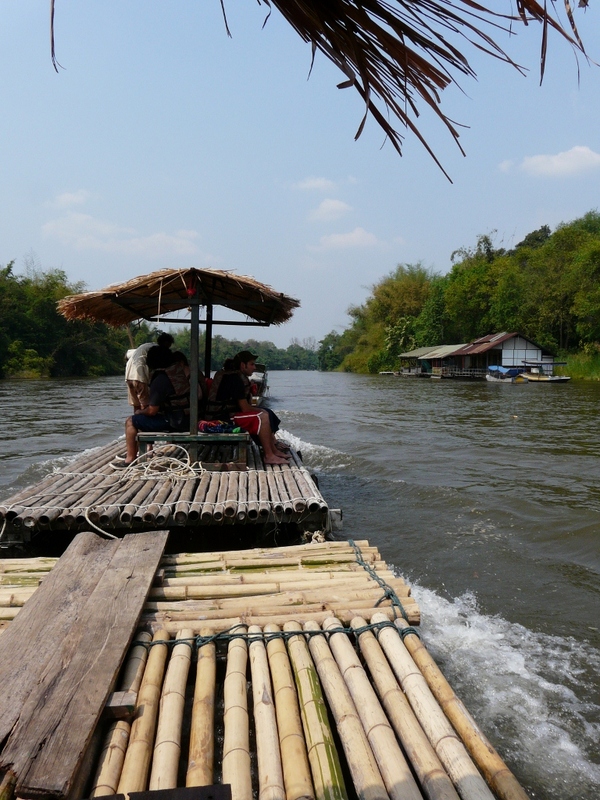 After an uncertain leap from the raft onto the shore, we walked up the bank to where our elephants awaited. 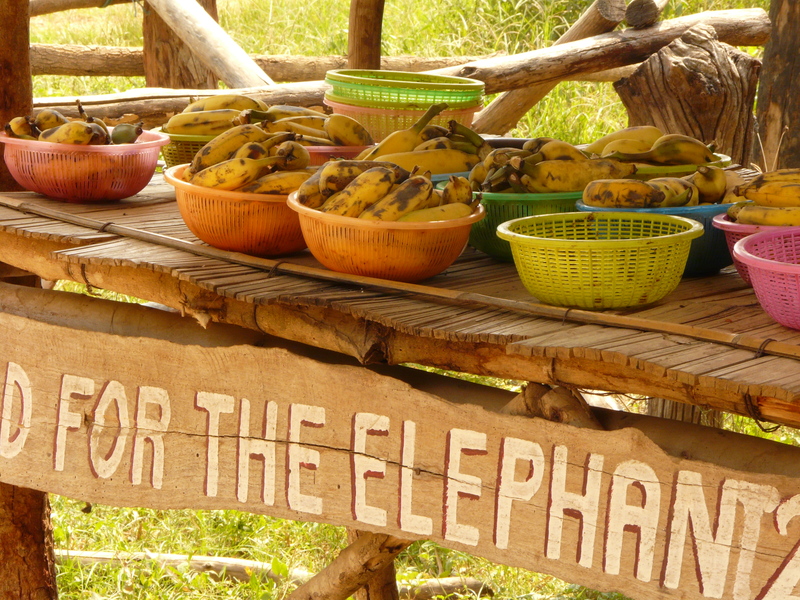 With great sympathy, we climbed onto the smallest elephant of the bunch, and unluckily for us, we also had the youngest and cheekiest driver of the bunch. 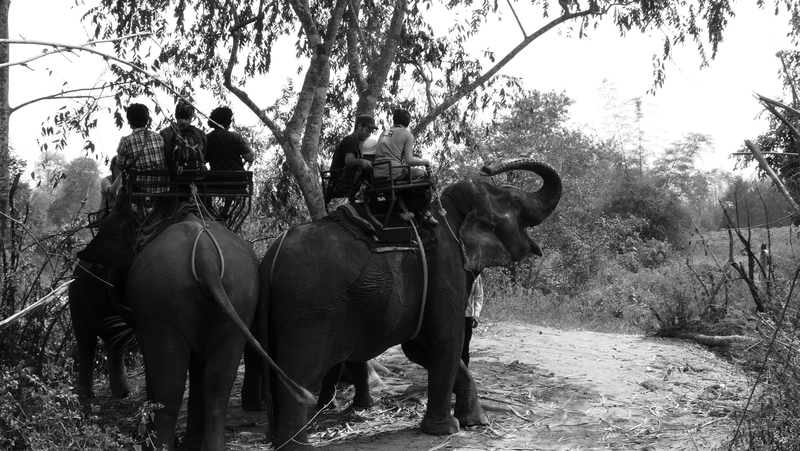 As we meandered slowly behind the other elephants, and began to relax into the ride, our driver decided to take us off-road! Glancing back over his shoulder, he threw a mischievous grin our way and then proceeded to nudge the enormous animal down the steepest incline he could find. Roger and I involuntarily flopped forward, our chins hovering above the elephant’s great flapping ears, and our legs scrambling clumsily backwards as we desperately tried to stay in our seats. He also thought it would be funny to stop the elephant halfway down the steep slope, leaving us suspended awkwardly in mid-air for what felt like centuries, before kicking the elephant back into action. And as it lumbered up the bank on the other side, we tumbled backwards, our stomach muscles straining and buttocks clenched tightly to hold us upright so that we wouldn’t roly-poly backwards off the elephant’s rump. Me, Roger the sheikh, our elephant and the brat! During all of this our elephant driver sang loudly, at least I don’t think he was rapping, to his heart’s content in Thai, kicking the elephant behind the ears and shouting “Hee-yah, hee-yah!” every now and then. Yes, very bloody funny. Freak the white – sorry, slightly tanned by this stage – tourists out! Of course it’s just not an elephant ride without getting a trunk full of elephant snot blown up your leg, which only I had the pleasure of enjoying! I’m not sure if that was also from the encouragement of the little brat seated in front of me, but I wouldn’t trust him as far as I could throw him! Following our very nerve-wracking elephant ride, it was back into the mini-bus again (GROAN) and this time we stopped at the Tiger Temple, a wildlife sanctuary run by monks. It is a place where they open their doors to the public, and for a fee (of course!) 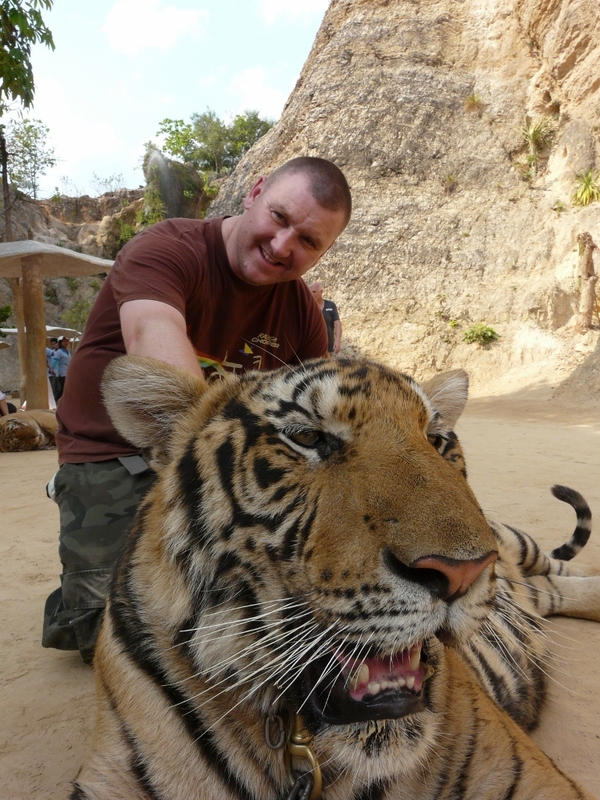 you can get your photo taken with a wild tiger – no fences, no tranquilisers – just you and a vicious, man-eating tiger. 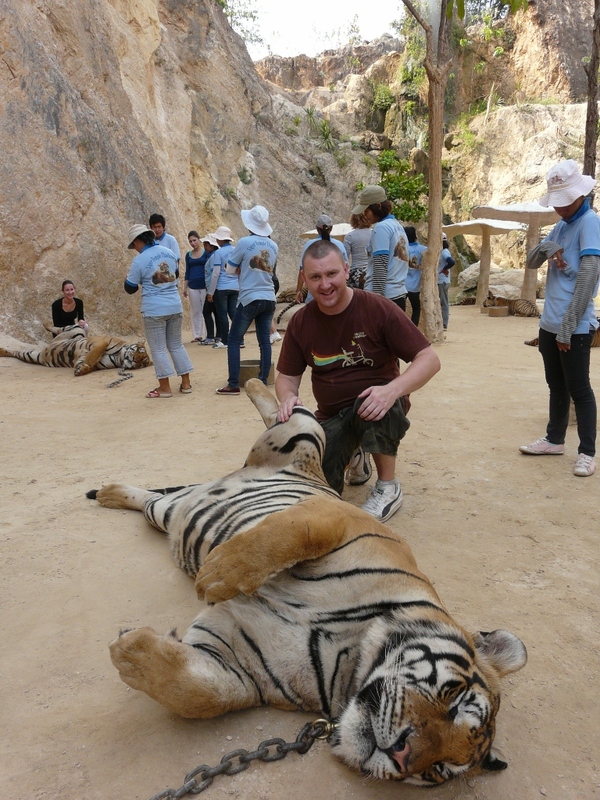 Roger and a tiger at the temple. First, one guide takes you by the hand and walks you around the tigers while another guide follows you with your camera and takes photos of you. So, there you are, in a sandy canyon in Thailand, holding hands with a strange Thai man, strolling amongst twelve gigantic tigers and smiling uneasily into the lens of your camera that you know will capture your messy and gruesome death should the tiger you have your hand on smell the fear oozing from every pore in your body! I don't think I look as comfortable as Roger. In fact, it would be safe to say I was shitting bricks! Of course there are a lot of precautions to be taken: no red or striped clothing; no hats; no sunglasses; no bare arms or legs, especially the temptation of a succulent thigh; and finally no sudden movements – which is not applicable to the tigers, as Roger discovered when he placed his hand on a tiger’s thigh and the huge beast threw its legs wide open, sending his heart into atrial fibrillation! This tiger almost sent Roger running for his life! 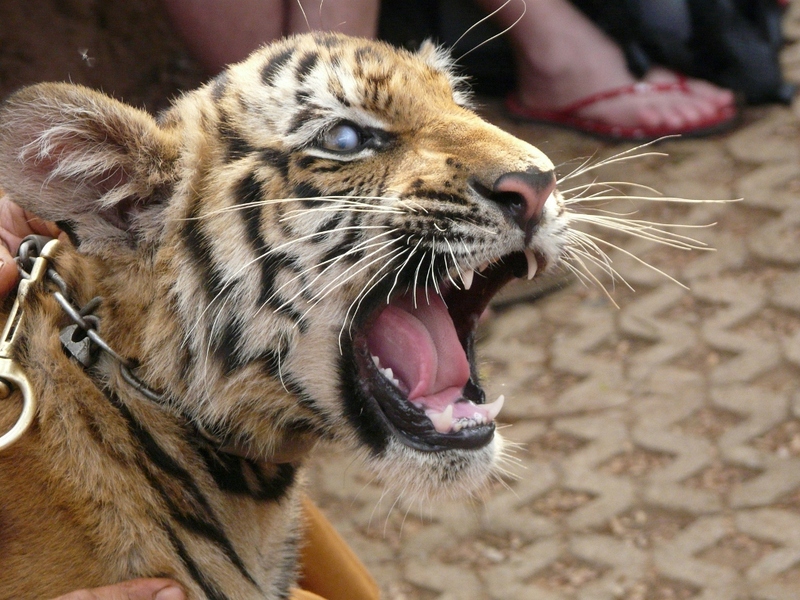 We also spent a small amount of time with some tiger cubs and this was where we questioned the humanity of the Tiger Temple. One small cub, attached to a peg in the ground by a leash, moved round and round in a figure eight for the entire fifteen minutes I sat watching it, while another young cub cowered in fear when a monk raised a bamboo cane in front of its face. These two examples, and a few others I won’t go into here, left a bit of a sour taste in our mouths. The temple closed twenty minutes after we had arrived and soon we were back on the bus from hell again (GROAN GROAN) heading back to Bangkok. It had been a long and uncomfortable day. Our day started at the hostel at 6.45am and ended there at 7.30pm. The total time spent off the bus enjoying the sights was about four hours – you do the math!